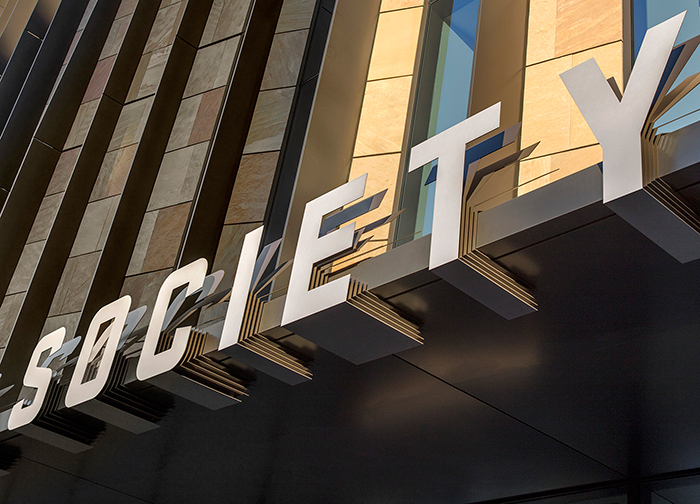 The Beus Center for Law and Society marks a dramatic shift for the Sandra Day O’Connor School of Law at Arizona State University (ASU) from its previous home in Tempe to the heart of downtown Phoenix. 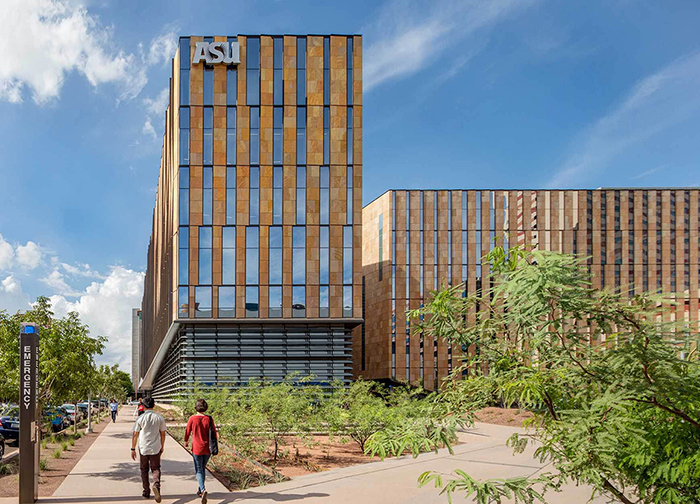 The goal of the new building designed by Ennead Architects, is to both bring ASU Law students close to the legal, political, and economic heart of Arizona and to connect students, visitors, and the general public to the role of justice in society. The building-a six-story, 280,000-square-foot complex-features the Great Hall which opens directly to the outside via a 50-foot wide by 25-foot high glass door along with 16 other spaces that are open to the public. 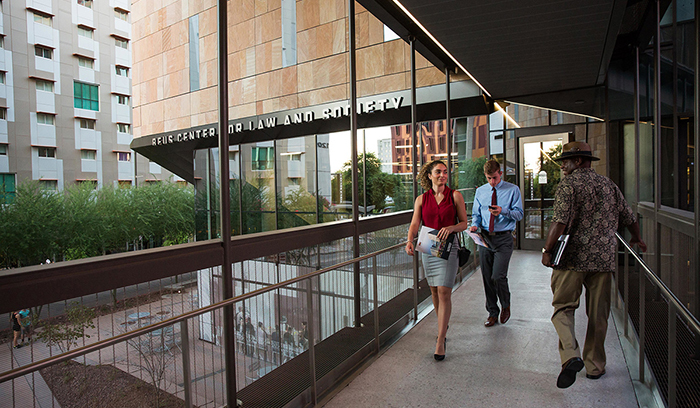 In addition to the law school, the building houses a variety of organizations dedicated to the law and the design of the complex fosters collaboration between them, including the Arizona Legal Center, Lincoln Center for Applied Ethics, The McCain Institute for International Leadership, Sandra Day O’Connor Institute, Arizona Voice for Crime Victims, and the Arizona Justice Project. Another occupant of the Center, the ASU Alumni Law Group, takes the teaching hospital model and applies it to the law, creating a nonprofit law firm that provides legal services to the public at low cost, a first in the country. 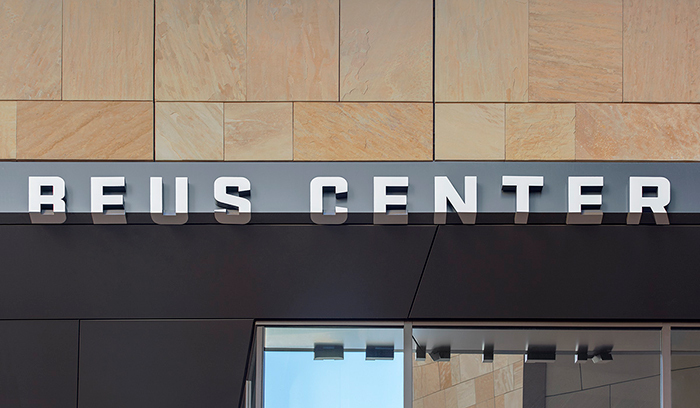 Poulin + Morris created a comprehensive environmental graphics, donor recognition, and wayfinding sign program that utilized materiality and scale to build an organic relationship to the architecture of the Beus Center. 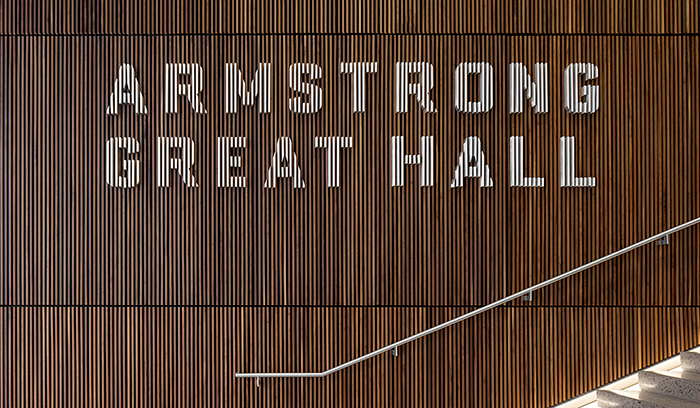 For example, the two-story slatted wood wall of Armstrong Great Hall provided an opportunity to create a three-dimensional typographic statement by inserting a contrasting white substrate in between the vertical slats of wood. Exterior identification signs coordinate with the nuances of the architecture by fanning, folding, and bending around the building’s structural elements. The project scope includes informational, identification, directional, and code-related signs for the building exterior, as well as for all interior spaces including the lobby, great hall, library, classrooms, conference rooms, offices, career center, and courtrooms. 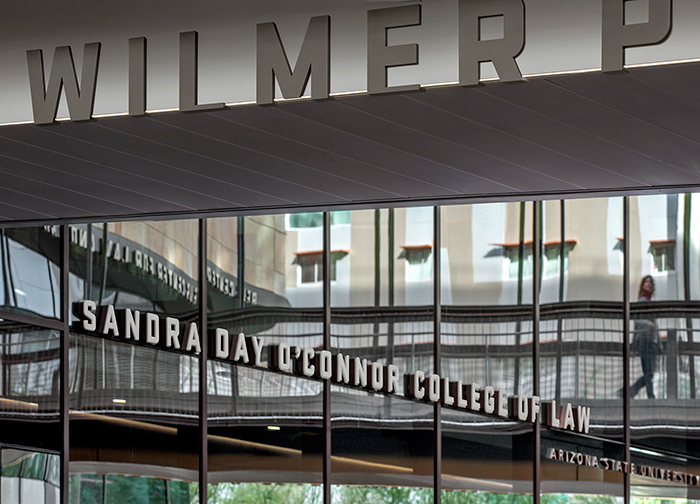 The adroit combination of technique, material, and typography has resulted in a program that reflects the innovation of both the architecture of the Beus Center for Law and Society and the institutions within its walls. © Poulin + Morris Inc. All rights reserved 2017.